We are Manufacturers and exporters of high quality Demerara Sugar from India. Our Dumerara Sugar is widely used in various Industries including Hotels, restaurants and Coffee shops. We are exporting Demerara Sugar to UAE, GCC, Jordan, Israel , whole Europe,(Germany, Polland), UK, Indonesia, South Korea, Africa (Especially South Africa). We are a successful Manufacturer, Exporter, and Supplier of Demerara Sugar. 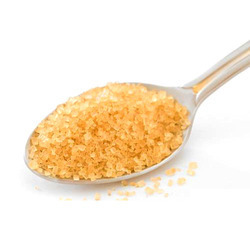 The Demerara Sugar we make available is pale to golden yellow color. Its sugar is a type of unrefined sugar with a large grain. Get in touch with us for bulk orders of sugar within the stipulated timeframe. It is extracted primarily from sugar cane, rather than sugar beets, and tends to be more expensive than refined sugars. The minimal processing gives demerara sugar a unique flavor and texture. Demerara sugar has a rich, creamy, molasses-like flavor which enhances baked goods. Used in cooking and baking projects. Used as a sweetener for Tea and coffee.